As if Arkham Asylum weren't sprawling enough, get ready for Batman: Arkham City, Warner Bros. Interactive's ostensibly metropolitan sequel to its 2009 blockbuster action game. When's it coming? 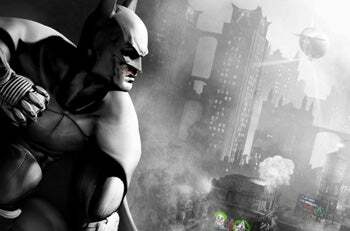 Fall 2011, for PC, Xbox 360, and PlayStation 3, according to developer Rocksteady Games. If you want to see the new dedicated website, that just launched, too. Where's it take place? Why Gotham City, of course, but not the city entire. If you caught the teaser trailer released last December (now viewable on the official site) you witnessed the camera panning away from everyone's favorite tumbledown loony bin and wending its way through the junked-up city streets of Gotham itself, implying something epic on the scale of, oh, Grand Theft Auto. Well not quite. It turns out 'Arkham City' is just Gotham's new "maximum security home" for all the city's super-villainous ne'er-do-wells, a slice of the city with "heavily fortified walls" somewhere near the heart of it all. We should probably be thankful the developer isn't trying to mimic Rockstar here. We know how well that turned out for Treyarch with all those territorially shallow Spider-Man games. Popping up in the sequel, expect to see Joker, of course (voiced by Mark Hamill for the last time), but also a few majors absent (or incorporeally present) in the prior game, e.g. Catwoman, Mr. Freeze (voiced by Maurice LaMarche), Talia al Ghul (Ra's al Ghul's daughter, voiced by Stana Katic), Two-Face, and The Riddler. New story, check. New gadgets, check. Vague gameplay details and absent screenshots, check and check. And fall 2011? Over a year to wait? That's just pitiless, Warner Bros.